• -20 .. 110 °C (narrow range). These ranges are selected using the switch placed on the side of the sensor box, next to the thermocouple wire. 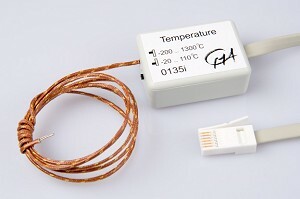 The sensor uses a thermocouple type K. The thermocouple consists of Chromega (Nickel - Chromium) and Alomega (Nickel - Aluminium) wires that are welded together at one end to form a measuring (hot) junction. The other ends of the wires form the so-called cold junction.